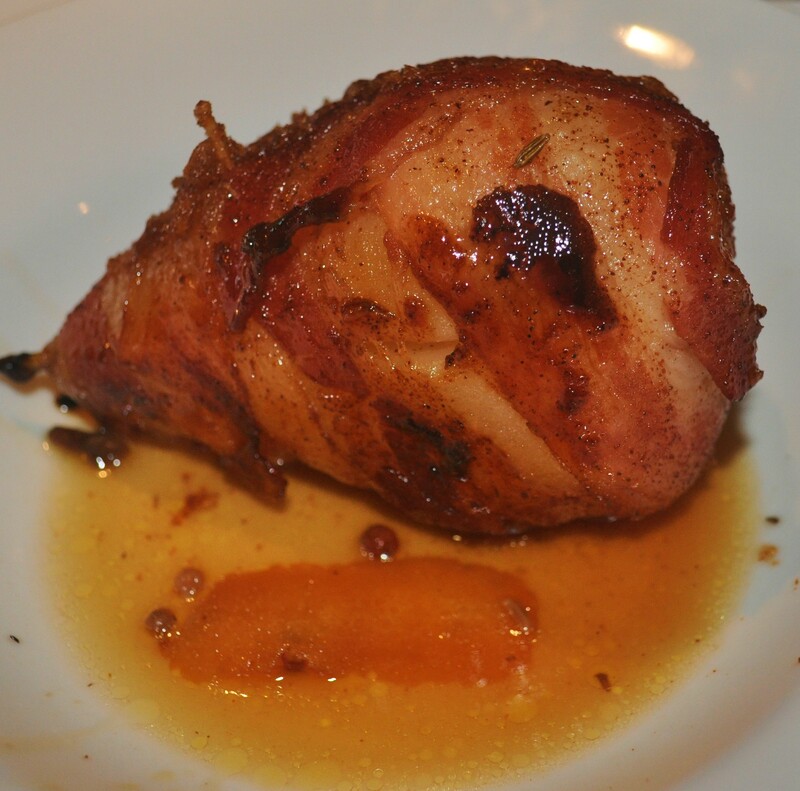 Candied Prosecco Poached Pears Filled with Brie and Wrapped in Bacon | The Sassy Spoon: Fun Food! This recipe came about, as many do, with an inspiration from another cook. My friend Caterina Borg who has the fabulous food blog Good Food Gourmet. 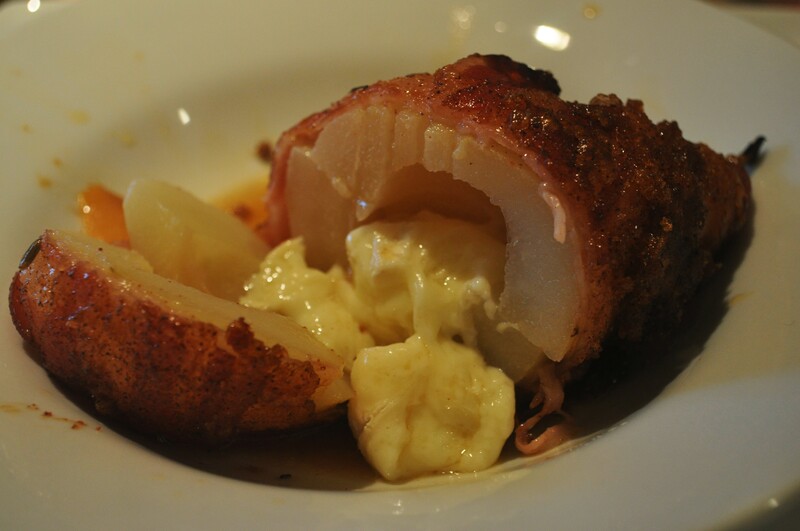 She made this post back in October about poached pears stuffed with Brie. She was inspired by another food blog Palachinka. Here is Palachinka’s original post with a different spin on the theme. Palachinka’s post was inspired by a recipe in Sale&Pepe magazine, Serbian issue for December 2009. I had planned to make this as an appetizer, but could not find small pears, so I made it as a first course, served in bowls with a reduction of the poaching liquid spooned over. This would also go great on some lightly dressed greens. Enough wine to cover 6 pears in a pot (2-3 bottles). I used prosecco, but you could use any wine you like. Port is great for this as would be a merlot. Each with their own distinctions. 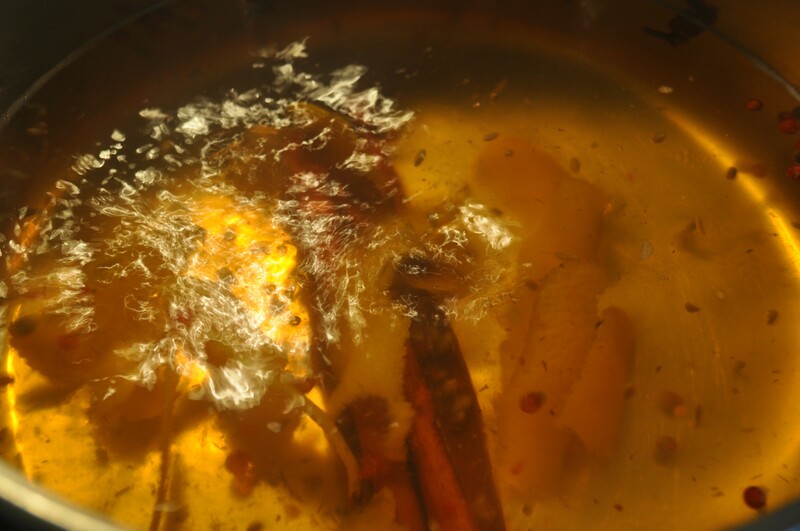 Aromatics: I used fennel, pink pepper corns, thyme, cinnamon sticks, big slices of orange peel and cloves. Star anise would be nice this too. Peel pears and place in a large pan so that they are in a single layer. 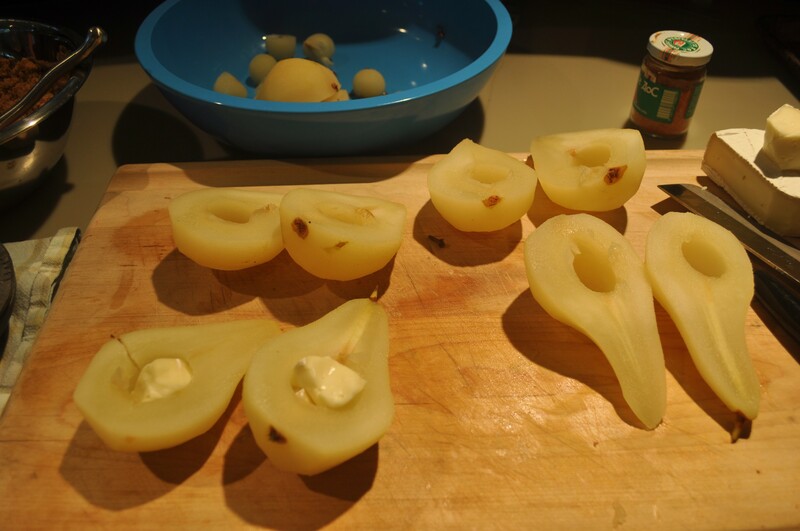 Bring to a boil and then reduce heat and simmer for 15 minutes, remove pears to another bowl for cooling. Turn the burner up to a rolling simmer and reduce the poaching liquid by half. When pears are cool, cut in half, scoop out the center with a melon baller and fill the cavities with peeled brie, then put back together. Wrap each pear with 2 slices of bacon, if you have a really large pear, you might need three slices. Hold together with toothpicks. Place standing up on a silpat or parchment lined baking sheet and bake at 400 degrees for 15 minutes, or until the bacon is crispy. Place each pear in a bowl, mine were laying down, but you could place them standing up too. Spoon the remaining poaching liquid with the aromatics over each pear. Serve with a sharp knife so the bacon is easily cut through.